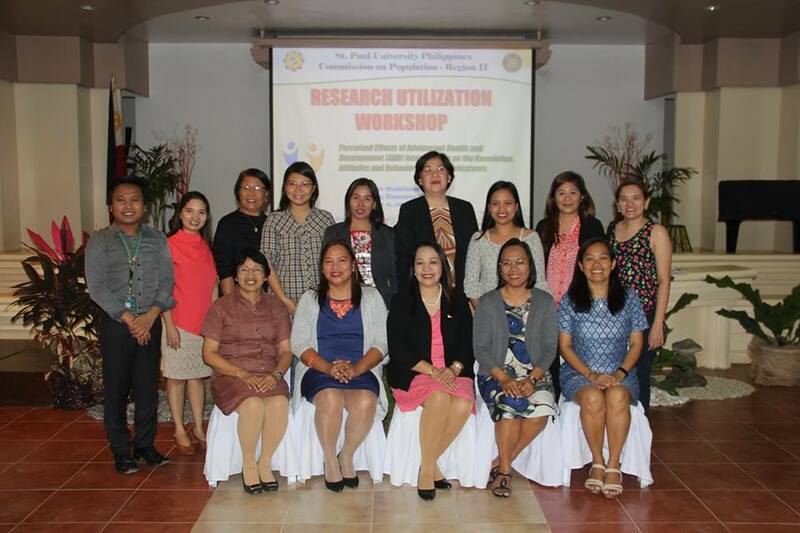 Through the Regional Research Utilization Workshop (RUW), faculty researchers of St. Paul University Philippines (SPUP) presented the findings of their collaborative research to population stakeholders of Region 2 at the Mother Madeleine Hall, Learning Resource Center Building, SPUP, on February 6, 2019. Sr. Merceditas Ang, SPC (University President) showed her support to the undertaking by welcoming the delegates from the different schools and government agencies. She also shared her insights, saying that through research, people gain access to empirical data which serve as basis for policies, systems, and processes. The research on “Perceived Effects of Adolescent Health and Development (AHD) Interventions on the Knowledge, Attitudes and Behavior (KAB) of Adolescents,” was funded by the Commission on Population (PopCom) Regional Office 2 and focused on assessing the effectiveness of the various PopCom AHD activities on the KAB of the youth in the Cagayan Valley Region. Dr. Emolyn M. Iringan, the research project leader, discussed the methodology used in the research, the findings as regards the participants’ knowledge on AHD, as well as the results of the focused group discussions (FGDs) conducted with the research participants consisting of adolescents in Cagayan, Isabela, Quirino, and Nueva Vizcaya. The rest of the research team also talked about the other salient aspects and results of the study. Ms. Evelyn Elizabeth L. Pacquing gave an overview of the research, explaining its rationale including the conclusions and recommendations drawn from the findings. Ms. Lita A. Jose presented the socio-demographic profile of the participants. On the other hand, Dr. Josephine D. Lorica discussed the findings as regards the participants’ attitudes on AHD; she also elaborated on the proposed action plan derived from the research discoveries. Also, Dr. Claudeth U. Gamiao expatiated on the results concerning the participants’ behavior on AHD. After the presentation of the research findings, the activity allowed the municipal, provincial, and regional population officers to ask questions through an open forum, where several issues concerning the results and their implications were clarified. Comments and suggestions for refining the research report were also considered. Following the open forum, Ms. Rosario B. Eugenio, Planning Officer I, PopCom Region 2, facilitated a workshop in which the stakeholders formulated action plans integrating the findings of the research. Such action plans are aimed at enhancing the AHD programs implemented in their respective domains or units. Dr. Herita O. Macarubbo, Regional Director, PopCom Region 2, lauded the SPUP Research Team for conducting the research whose funding was awarded to SPUP which, according to her, is the best among the higher education institutions (HEIs) that submitted proposals. For the concluding part, Ms. Theresa C. Soriano, Assistant Regional Director-Designate, PopCom Region 2, delivered the synthesis of the RUW.